Pedro Kumamoto,May, 2015. Wikicommons/Alvaro Quintero. Some rights reserved.In June 2015, a 25-year-old called Pedro Kumamoto became Mexico’s first member of parliament to win a seat without belonging to a political party. His collective, Wikipolítica, which emerged out of Mexico’s versions of Occupy Wall Street, decided to get involved in the politics of representative democracy, taking advantage of a new law that allows independent candidates to stand for election. The first election slogan chosen by Wikipolítica had a strong urban focus: “Occupy the city, inhabit politics”. Wikipolítica’s leaders are clear that they have to keep growing and spreading, while maintaining their autonomy from governments. In June 2015, a 25-year-old called Pedro Kumamoto became Mexico’s first member of parliament to win a seat without belonging to a political party. Kumamoto and his team decided to canvass door-to-door in district 10 in the state of Jalisco, calling on people to participate and appealing to their sense of belonging to a local community. The progressive, anti-neoliberal Pedro Kumamoto managed to win over a historically conservative district that was deeply disenchanted with the traditional political parties. 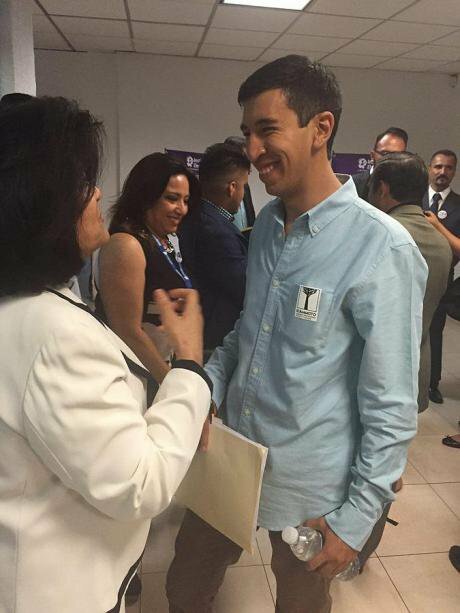 Kumamoto says that, “his work as an MP will rely heavily on the city – in his case Guadalajara and Zapopan – and the territory.” City halls nowadays have to dialogue not only with classical civil society organizations, but with new types of collectives. The surge in support for Pedro Kumamoto’s Wikipolítica was matched at a state-wide level by the Citizens’ Movement, a new political party, that won control of 24 local councils. An MP’s official powers are not always sufficient to influence city government, but Pedro Kumamoto plans to set up local citizen laboratories to help overcome this by working towards his policy positions at the municipal level. On the other side of the Atlantic, in Spain, we find a similar situation with new municipal governments whose ambition, similarly, is to go beyond their conventional powers. The explosion of what is known as Spanish ‘municipalism’ represents the most visible face of the growing role of cities and local governments around the world. In May 2015, in Spain’s greatest political surprise in decades, citizens’ groups won local government elections in cities as important as Madrid, Barcelona and Zaragoza. British journalist Paul Mason argues that Spanish municipalism is building a new model of a city based on collective intelligence and collaboration between citizens that will challenge the hegemony of the large neoliberal corporations with their concept of the ‘smart city’. On the other side of the Atlantic, in Spain, we find a similar situation with new municipal governments whose ambition, similarly, is to go beyond their conventional powers. Spanish municipalism has certainly succeeded in channelling much of the spirit and symbolism of 2011’s 15M-Indignados movement into the politics of representative democracy, which used to be its main enemy and taboo. Thus, ‘made in Spain municipalism’ has become the first of a series of networked rebellions started by the Arab Spring, where a movement first resisted the politics of representation and then sought to transform it. Second, inspired by the forms of organisation developed by 15M, Spanish municipalism has invented a political format known as “confluencia”, which is “neither a coalition nor an alphabet soup of political parties, and transcends the sum of the parts that comprise it”. 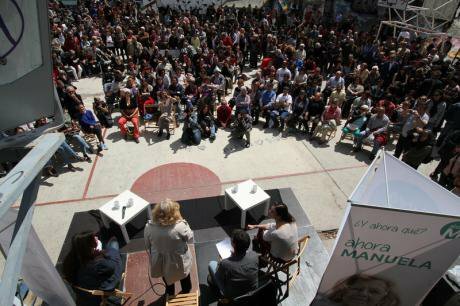 There is, however, another aspect of Spanish municipalism that has not been highlighted by the mass media: their ambition to set the agenda on issues that go beyond the traditional powers of municipal governments. When the new Ahora Madrid government declared the city of Madrid a GM-free zone, joining a European network of 200 regions and 4,500 local authorities, it was a far from insignificant act. The network of cities that welcome refugees, proposed by the mayor of Barcelona, Ada Colau, grew from a Facebook post that went viral to a reality that many other cities in Europe have adopted. The ability for cities to change certain laws and practices exceeds municipal powers, but cities can activate mechanisms, find legal loopholes and – above all – develop a narrative of resistance and joint action. The fact that cities have managed to lead on refugee issues at a time of ineffective European Union-level political responses is a clear example of cities’ potential in an unstable global macro-political ecosystem. The municipal-level ambition of the Mexican MP Pedro Kumamoto and the global vocation of the confluences governing Spain’s main cities are two sides of the same coin: the growing role of cities in taking political governance in new directions. These two cases also open up the possibility of a global network of cities working for the commons and challenging the neoliberal order. The hyper-local is gradually becoming globally reconnected in a new world ecosystem in which the superstructures that represent nation-states have ever less influence over policy. What should the twenty-first century model city look like? What are the challenges in a world where nation-states are being decimated by the global economic order? 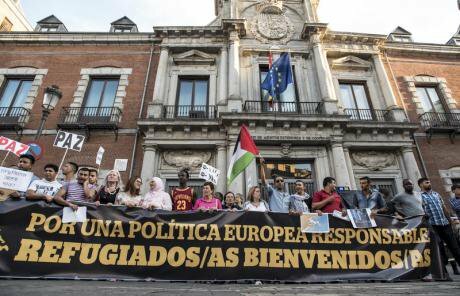 Madrid in solidarity with refugees at Ahora Madrid HQ.Demotix/ Jorge Sanz. All rights reserved.In City of fears, City of hope (2003), Zygmunt Bauman talks about two important concepts related to the modern city: mixophobia (the fear used by institutions to discourage the use of the public space) and mixophilia (human and cultural mixing in cities). His main conclusion, however, is that nation-states are in decline and cities are our era’s principal political space. The financial crisis that destabilised the global economy in 2008 led some leading economists such as Joseph Stiglitz to predict the end of neoliberalism and the resurgence of public investment, but exactly the opposite has occurred. All states have done is feed the spiralling public debt, hand over public funds to the private banking system and downsize themselves through austerity policies. The ability of nation-states to determine their own economic policy has continued to decline, while the influence of supra-state institutions at the service of neoliberalism such as the Troika has increased. The result of the Troika negotiations with the Greek government under Alexis Tsipras confirms the weakness of national governments’ room for manoeuvre against international capital. In this context, authors such as Benjamin Barber argue that the world would be a fairer and more equitable place if it were governed by mayors. Of course, the law does not give cities enough power to change the economic policy order designed by global neoliberalism, however I believe cities can develop a different policy agenda and a new type of politics with the help and collaboration of social movements and empowered citizens. 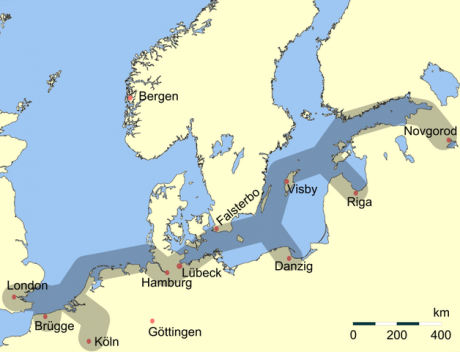 Main C13th trading routes of the Hanseatic League. Wikicommons/Flo Beck. Some rights reserved.So, what is the real role and/or potential of twenty-first century cities? Part of the answer may be found in history. The ancient Phoenicians, Greeks and Carthaginians built networks of cities whose organisation did not follow or refer to the nation-state format. The same was true of the network of Italian cities that emerged from the eleventh century onwards, or the Hanseatic cities, which had no civil servants or army. These networks of cities were not so much city-states as cities against the state, as their set-up enabled them to avoid being caught up in the state mosaic. In the twenty-first century, nation-states and institutions tend to deploy all sorts of legal restrictions that exacerbate mixophobia. Cities can, however, encourage mixophilia from the ‘inside’ (through municipal action) and from the ‘outside’ (through citizens acting autonomously). City councils can, like Madrid, be aggressively anti-GM, bringing about a shift in the terms of the debate: the most important thing is not to determine whether GM food is harmful to health, but to challenge the capitalism of the agro-industrial multinationals that are devastating people’s lives and the environment. By championing causes that go beyond their own powers, cities are opening the way for new policies, laws, practices and tools. 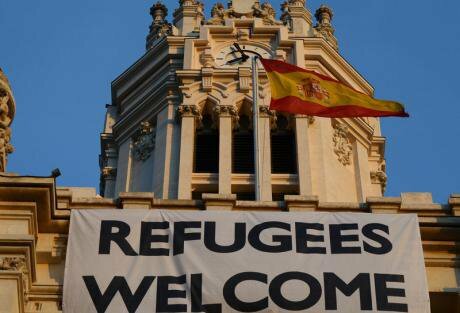 Outside Madrid's ministry of foreign affairs, September 2015. Demotix/ Nacho Goitre. All rights reserved. The Greek cities that are disobeying the Troika by refusing to implement the electricity tax hike are another good example: they forced a change (the reformulation of the tax) after Alexis Tsipras became president. The book La apuesta municipalista, which sets out the theoretical foundations of the Spanish “confluences”, argues in favour of “the politics of the local space” against the state. It builds on an intuition about the global “outside” that has existed since the social uprisings of 2011: the urban space can be the lever of change. The concept of the ‘Right to the City’, formulated by Henry Lefebvre in 1968, has been in vogue for some years: it concerns the right to the urban space that belongs to us. In his recent publications, the Marxist David Harvey has gone further than the World Charter on the Right to the City that emerged from the World Social Forum (WSF). His book Rebel Cities, published in the heat of Occupy Wall Street, gives the idea a masterly new twist: the right to the city becomes “the right to modify the city collectively” and “to change ourselves” in the process. The year 2011, which saw the largest number of rebellions around the world in recent times, reconfigured the urban space as a new interface of political action and creativity. The format of the street camp, exported from the Arab Spring to Spain’s 15M and Occupy Wall Street, shook up the 'protest' format. Even Saskia Sassen, who coined the term “global city” as one where international financial markets are present, adapted her own theory following the occupation of Tahrir Square in Cairo. She started to talk about the “global street” as a “hard space” where “the powerless” manage to “do politics”. The mutation of the global city into the global street is a desirable political agenda for the planet. The global street (a space both physical and semantic) and the rebel cities (as a combative remixing of the right to the city) have become narrative expressions of the global 'outside'. Indeed, some of the most important social uprisings in recent times, such as the Gezi Park revolt in Turkey, the Movimento Passe Livre (MPL) in Brazil and the Gamonal protest in Burgos (Spain), have had the urban space as their initial cause. The city is also the setting for the continuation of many revolts: in Augusta Park in São Paulo, Can Batlló in Barcelona or the community-managed Embros Theatre in Athens, among many others. Manuela Carmna addresses the public at El Campo de la Cebada in Madrid, April 2015.. Demotix/ Jose_Hinajosa. All right reserved. The city is the battleground for many movements opposing neoliberalism. “To fight for a city we can live in is a form of dissidence”, they say in Temblor, the Spanish arm of the Radical Democracy: Reclaiming the Commons project. In a way, some of the occupations of city squares in recent years function as a metaphor for the ideal city for which the diverse “outside” is fighting. These revolts have also allowed for constructing new models of participation and governance. During the Acampada Sol camp-out by Spain’s 15M in Madrid, which lasted for several weeks in May and June 2011, an online tool called Propongo was developed to allow anyone to make policy proposals. Although these policy proposals did not necessarily translate into policy changes, the online tool, whose source code was later used by the government of Rio Grande do Sul in Brazil, revealed society’s longing for participatory democracy. The occupation of Gezi Park in Istanbul in May–June 2013 likewise fought for urban common goods under the banner of “citizen self-organisation and the desire for direct democracy”. Similarly the occupation of Augusta Park in São Paulo created a space of collective resistance to neoliberalism and gentrification, as well as non-hierarchical policy-making. Through assemblies, meetings and events, the participants in the Augusta Park movement and occupation took charge of the collective management of the park for months, without depending on the São Paulo city council or the market. The movement sought to place the commons at the epicentre of the struggle, arguing that “A public park is a common good that belongs to the city’s social network and must not remain under the control of private or speculative interests”. What lessons can local governments learn from these revolts? What do the protagonists of these revolts and the governors of cities have in common? Is there any possibility of a shared agenda? Which of the new movements’ participatory methodologies and tools can be taken up by local governments? Writer Matthew Fuller and architect Usman Haque, both from the UK, have been studying the relationship between the so-called hacker ethics and cities for several years. Inspired by the copyleft movement, which emerged with the free software movement, Matthew and Usman set out to craft a licence for the building and design of open source cities: the Urban Versioning System 1.0.1 (UVS). In it the authors argue that copyleft, which lifts restrictions on the copying and re-use of codes, is the best tool for ending a model of exhibitionist architecture and closed-formula proprietorial urban planning which restricts citizen collaboration. They argue that citizen collaboration based on free technology, collaboration, shared information and collective practices can lead to radical transformations of our urban space: “UVS recognises that the world is constructed by its inhabitants, at every moment”; “People will, collaboratively, take a design in directions you could never have imagined”; “Only a mode of construction that is capable of losing the plot is adequate”. Citizens would be able to participate in the processes of constructing the city, managing its data or changing its laws. The model city proposed by Fuller and Haque seeks to open up its operating system’s code, which might be legal, architectural or information-based (data, content). The change is radical: the city would thus be transformed into a democratic artefact in every sphere. Citizens would be able to participate in the processes of constructing the city, managing its data or changing its laws, among other things. The city would cease to be an artefact designed from the top down and would become one that everyone can alter by means of certain bottom-up processes. The architect Doménico di Siena also theorises about the open source city and considers it vital to shift from urban models “based on the creation of efficient products and services that force us to be constantly on the move (and constantly consuming), to models based on information management and knowledge production (self-organisation)”. The open source city clashes head-on with the paradigm of the smart city based on proprietary technology and mass surveillance, which prevails today. The smart city model created by the big multinationals sees the city’s data as a commercial product. Furthermore, the way this data is managed is opaque and lacks transparency. The relationship between the multinationals and local governments also tends to be strictly commercial, which contradicts the spirit and practices of public services. The alternative, as articulated by Paul Mason, is of a non-neoliberal city based on “three principles not welcome in the world of high-profit tech companies: openness, democratic participation and a clear policy that data generated from public services should be publicly owned”. Mason points to the new municipal government of Madrid, which has launched the deliberative democracy website Decide Madrid, as a model of radical urban democracy based on free technology: “Instead of seeing the city as a ‘system’, to be automated and controlled, the vision being mulled in the Spanish capital conceives of the city as an ‘ecosystem’ of diverse, competing and uncontrolled human networks”. Urban regeneration residents' collective in Virgen, Begoña in Madrid. Paisaje Transversal.Some rights reserved.A few practical examples are the best way to understand the potential of open source code in urban settings. The independent initiative DCDCity-Aire Madrid is one of the best examples of the direction cities could take by following open source ideas and practices. DCDCity-Aire Madrid was the first application of the theoretical and practical framework proposed by “The Data Citizen Driven City”, a project designed by Madrid’s MediaLab Prado. Instead of relying on sensors installed by the tech companies and a centralised and closed form of data management, the project saw each citizen as a potential data producer. Thanks to the proliferation of smart phones and the profusion of free technologies, each and every citizen can become a data-gatherer. A simple Arduino circuit board (free hardware), connected to a mobile phone with the Android operating system, is sufficient to enable a citizen to gather data on the functioning of the city. In the course of one day’s work, a prototype and ten devices for measuring air quality had been built. DCDCity-Aire Madrid aspired to build a community around the problem of air quality in Madrid through participatory data-collection using patent-free technology. The way in which the project came about reflects the importance of a synergy between the public sphere and citizen autonomy that activates processes independently of governments. The support of MediaLab Prado, a publicly financed laboratory, was vital for DCDCity-Aire Madrid to take off. The Medialab hosted both the wiki and the online community, strengthened by private initiatives such as the Internet of Things Meet Up Madrid. In the course of one day’s work, a prototype and ten devices for measuring air quality had been built, with the hope that further systems could be replicated to cover other types of data concerning the city. While lack of funding at the time brought the project to a temporary halt, the new Ahora Madrid government has the potential to re-initiate funding and help to build an alternative model of urban data-gathering that takes advantage of the collective intelligence of a widespread citizen network. Furthermore, a working model of open data management could introduce a new type of relationship between the public and the commons and lay the foundations for other cities to follow. Interestingly, the free software approach, with code-sharing repositories and networked cooperation among a wide range of actors, facilitated the rise of municipalist candidates who ended up taking power. The citizen platform, Ahora Madrid, for example took advantage of the source code used by Zaragoza en Común to design its election manifesto collaboratively. Open source is thus part of the DNA of Spain’s municipalist candidates. Now in power, they are starting to promote the same idea of cooperating cities that encourage free technology, commons-oriented practices and collective action protocols. As we will see, Decide Madrid, the deliberative democracy platform launched by Ahora Madrid, is now being replicated by other cities. In order, however, to arrive at a model based on citizen intelligence we must open up the definition of technology. Ted Nelson, one of the pioneers of digital culture, maintains that “our social behaviour is the software and our bodies are the hardware. A society’s operating system would therefore be a series of common practices and human relationships, not just a set of online platforms. Open source code goes beyond the technology itself. The open source city is in tune with the concept of the relational city”. The model of the relational city proposes meetings, relationships and dialogue to counter the model of mass surveillance and centralised data control represented by the smart city. “In the relational model, security depends above all on recreating social ties. It doesn’t mean emptying the streets but quite the opposite: repopulating the streets with neighbourly relations, including neighbourliness between strangers.” The open source relational city aspires to be a source code that can constantly be modified by the collective intelligence. The model of the relational city proposes meetings, relationships and dialogue to counter the model of mass surveillance and centralised data control represented by the smart city. 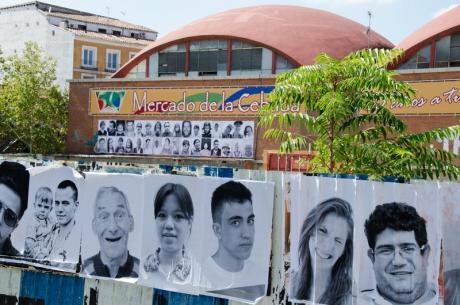 The experience of El Campo de Cebada in Madrid, a self-managed space that has had the legal support of the city council for five years, is a good example. While DCDCity-Aire Madrid exemplifies the way forward for collaborative collection of data and information, El Campo de Cebada illustrates how open source ideas and practices can relate to the physical space. El Campo de Cebada occupies a 5,500 square metre plot of land where the city council was supposed to have built a sports complex in 2009. The economic crisis meant the space was left empty. As a result, since 2010, local residents of all ages have transformed it into a community meeting, events and learning space. Eventually, the city council signed an agreement with local residents and community groups to cede the space to them temporarily. With the support and energy of young architect collectives and inspired by the community assemblies that emerged during 2011’s 15M, El Campo de Cebada became a site for all sorts of community initiatives including self-build furniture projects, permaculture and daily community-organised cultural activities. In 2013, El Campo de Cebada won the prestigious Golden Nica prize at the Ars Electronica festival, in the “digital communities” category. The fact that El Campo de Cebada, an initiative with an extremely strong territorial component, was recognised for its management of online communities is symptomatic of a new era in which digital networks and territory merge in a new hybrid space that is more democratic and participatory. Wall of Cebada market covered with 'Be the change' portraits, September 2012. Demotix/ Valentin Sama-Rojo. All rights reserved.It is important to note, however, that El Campo de Cebada also reveals the problems and limits of citizen self-management. To keep the space functioning, the community had to resort to crowd funding and even today has not obtained public funding from the city council. Despite the success of El Campo de Cebada, the experience has demonstrated that it is not enough to have legal backing for commons-oriented practices unless they are provided with public funds. The risk is immediately evident: the ‘Big Society’ idea touted by David Cameron in the UK or the Dutch government’s community participation projects are to a large extent about promoting voluntary work by citizens in order to justify the disappearance of the welfare state. To avoid reinforcing this, city autonomies and citizen self-management and collaboration have a crucial role to act as an incentive for mutual complementarity between public administration and citizens. In Madrid, the arrival of Ahora Madrid in local government has opened the way for a new form of public management of the common good. The independent Los Madriles project, an atlas of neighbourhood initiatives that maps hundreds of projects around the city, is being used by the new local government to understand the autonomous processes going on in Madrid. Furthermore, in the budget drawn up for 2016, the city council has introduced participatory management of these initiatives by neighbourhood residents. At the end of 2015, the Madrid city council also approved a regulatory framework for ceding the use of public spaces to community groups. The combination of ceding public resources and spaces and respect for the autonomy of social movements could pave the way for a new municipalist model of cities against the neoliberal state. 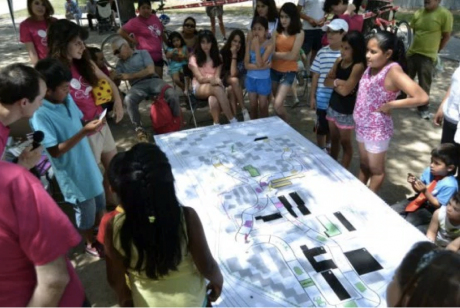 The twin facets of the open source city (free online tools and participatory territories) are shaping a new future for radical democracy. Theorists of the commons, Antonio Negri and Raúl Sánchez Cedillo, outline a thought-provoking relationship between the city and democracy: “metropolitan ways of life are now political and productive in general terms. Making democracy and (re)production of the city interact, we have the possibility to articulate the political”. This relationship between the city and metropolitan ways of life on the one hand, and democracy on the other, places local governments in a special, privileged position. As well as using free technology, any city council that wishes to build an open source city will therefore have to recognise and protect existing citizen practices (as well as foster new ones) that reproduce the commons and strengthen that new, post-capitalist mode of “production” whether they are community centres, self-managed spaces, gardening networks or peer-to-peer file sharing networks. The twin facets of the open source city (free online tools and participatory territories) are shaping a new future for radical democracy. The participatory repertoire of the Barcelona en Comú political confluence, which is currently governing the city of Barcelona, is seen as one of the models to be replicated. “Its radical democracy draws on a set of tools, techniques, mechanisms and structures to develop municipal policies from the bottom up. These include assemblies at various levels (neighbourhood, thematic, coordination, logistics, media, communication etc) and online platforms (for communicating, voting, working).” The role of Spain’s confluences, forged in networks and the street at a time when the other traditional social movements have failed to set the pace of change, is thus shaping up as one of the twenty-first century’s most advanced democratic laboratories. On 4 December 2015, the local council in the Spanish city of Oviedo, governed by the confluence Somos Oviedo, presented its online platform for direct, participatory democracy. The Oviedo platform is a replica of Decide Madrid, using the same open-licence free software. Pablo Soto, a Madrid councillor who participated in the live-streamed event to launch the Oviedo platform, said that Decide Madrid “is being studied by other cities such as Barcelona, Zaragoza, La Coruña and Santiago de Compostela”. In every city where the deliberative democracy platform is established, citizens will be able to present specific policy proposals. When a proposal gains a stipulated level of support, it will be approved, providing a change has been made to the law as the Madrid city council has already done. The fact that different cities are sharing the code for their digital platforms breaks with the smart city’s logic of proprietary technology and the paradigm of branded cities competing with each other. What has now been baptised as Spanish “intermunicipalism” seeks to create a network of “rebel cities for the common good” which share repositories, tools, digital platforms and methodologies. Intermunicipalism is likewise dealing a harsh blow to the market logic based on selling the same technological product to different cities. Intermunicipalism is... dealing a harsh blow to... market logic. Starting by sharing its technology, tools and platforms, intermunicipalism aspires to build irreversible political practices, thus ensuring that there is no turning back from participatory democracy. This is a participatory democracy that fits better with the post-capitalism advocated by Paul Mason or the economy for the common good than with the classic anti-capitalism of traditional social movements. “The geopolitics of the commons”, writes Daniel Vázquez in the prologue to the book on the Buen Conocer / FLOK Society project, possibly the most comprehensive road map for post-capitalist public policies, “opens up a new battlefront against cognitive capitalism and it does so through code connectivity”. The fact that a city like Madrid can share the code for its digital structures with any other city in the world, as well as with regions or even nation-states, illustrates this inspiring new era of networked transnationalism knitted around the common good and open source codes. A transnational municipalism could reconfigure the struggles of social movements to build this geopolitics of the commons against neoliberalism. As the Spanish case demonstrates, the lever of change wielded by municipal governments who gained power thanks to new ways of working can give the reconfigured struggle for the commons a new institutional scalability. It is no coincidence that some Brazilian cities (such as Belo Horizonte and Rio de Janeiro) and US cities (building on the Occupy Wall Street movement) are studying how to replicate the model of Spain’s confluences. As long ago as 1984, Murray Bookchin’s thesis on libertarian municipalism was already envisaging the possibility of a new scalable network of territories: “Interconnecting villages, neighbourhoods, towns and cities in confederal networks”. In the digital age, the confederation could be made up of inter-territorial, cooperative cities, against or without the state, going beyond the well-intentioned United Cities and Local Governments (UCLG) network, which still sees the ‘right to the city’ as the future. What is at stake is the life of neighbourhoods and, at the same time, the survival of democratic participation worldwide. The intermunicipal planet/neighbourhood, forever intertwined, may become the new cornerstone of global post-capitalism. Open source local government is the first step towards scaling up new public policy spheres and interwoven citizen practices that can make neoliberalism unnecessary. Code-sharing could reinvent global geopolitics and create a new horizon of transnational radical democracy. This essay is published as part of TNI's fifth annual 'State of Power' report, focused this year on the intersect between power and democracy.